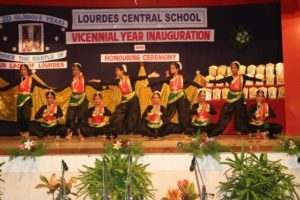 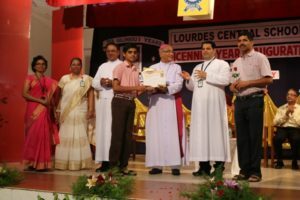 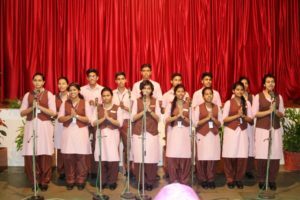 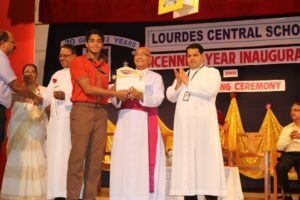 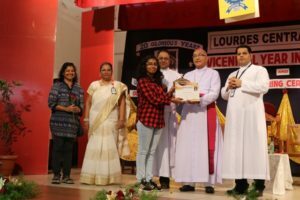 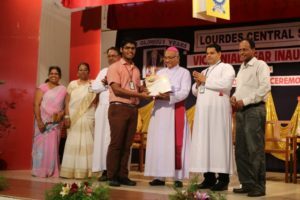 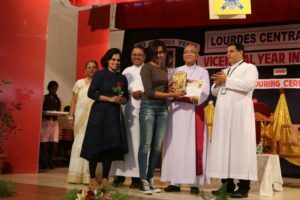 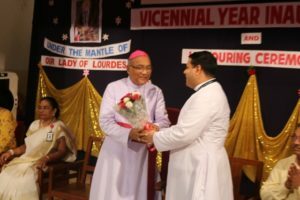 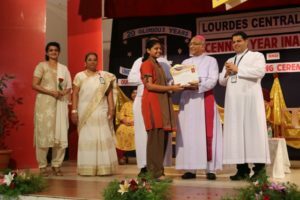 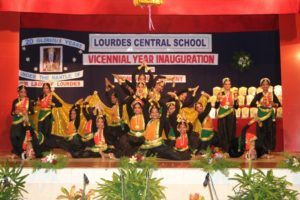 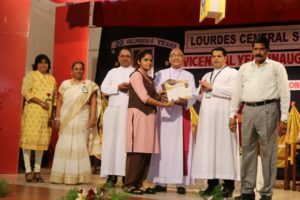 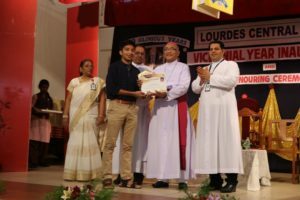 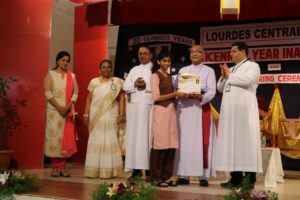 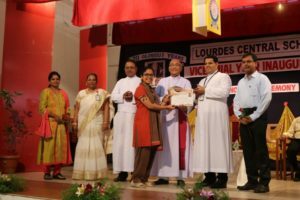 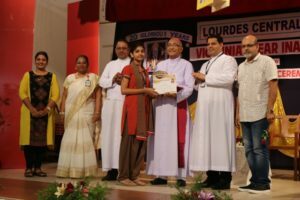 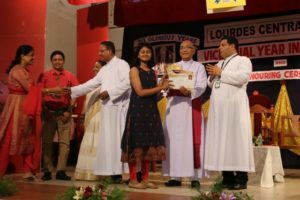 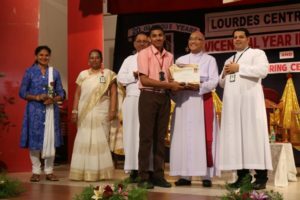 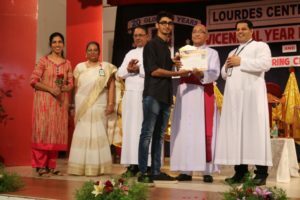 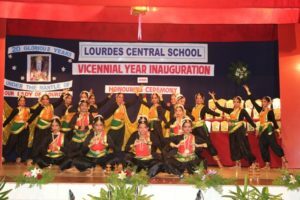 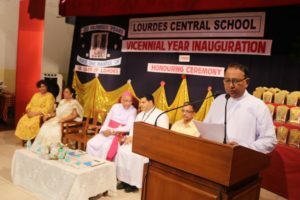 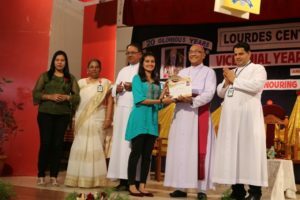 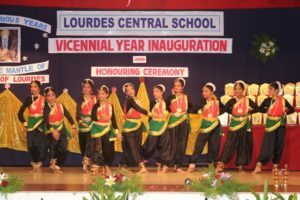 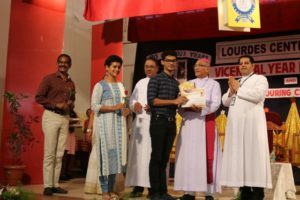 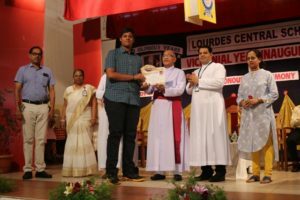 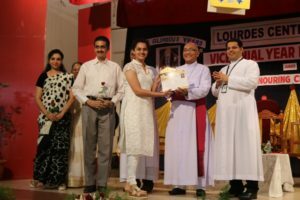 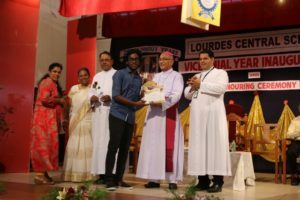 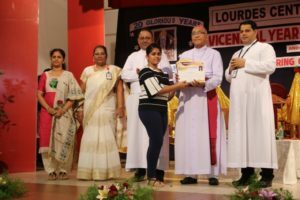 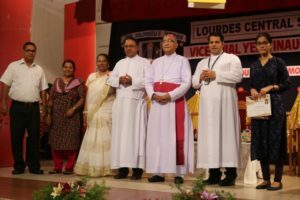 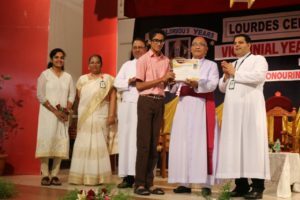 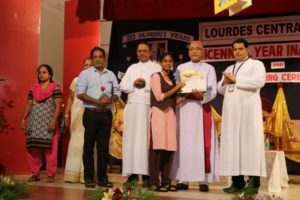 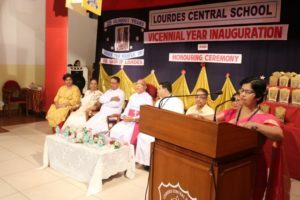 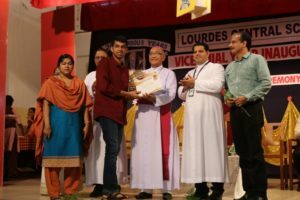 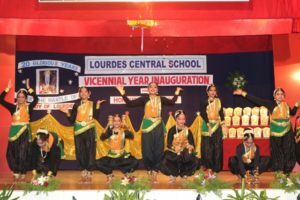 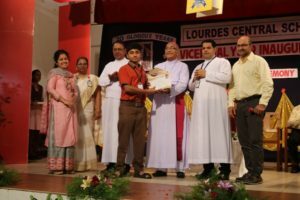 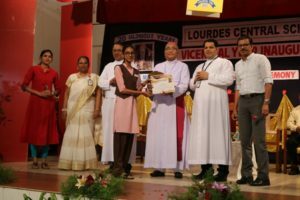 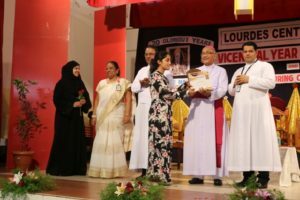 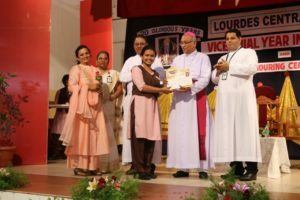 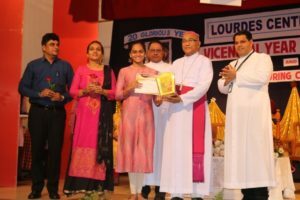 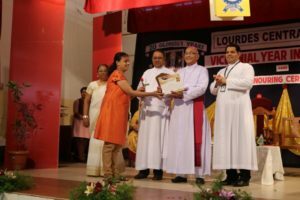 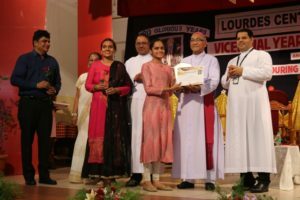 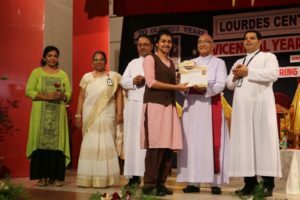 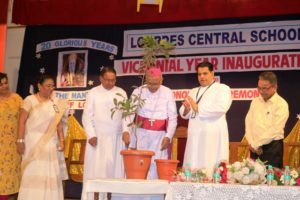 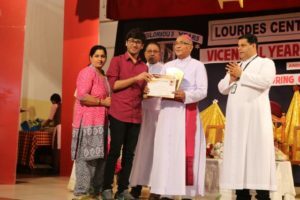 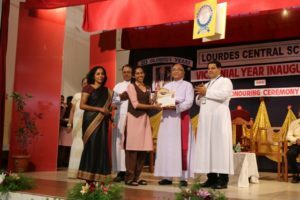 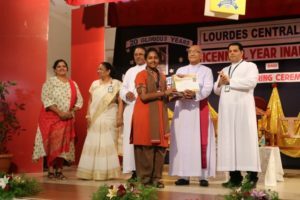 Lourdes Central School commemorated the beginning of 20 years of its establishment this academic year by celebrating the Vicennial year and honouring ceremony of the school toppers on 23 June, 2018. 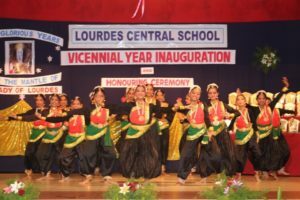 The event commenced with a resplendent welcome dance, which was followed by a befitting and harmonic prayer song. 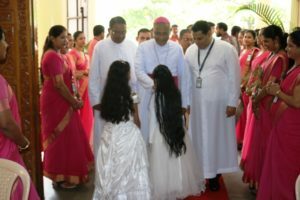 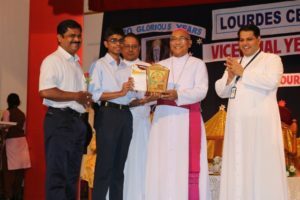 The dignitaries; Bishop of Mangalore and President of the Catholic Board of Education, Most Rev. 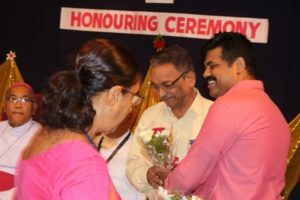 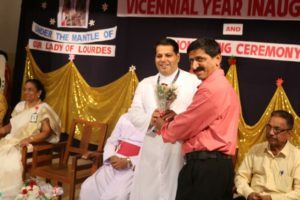 Dr Aloysius Paul D’Souza, School Manager Rev. 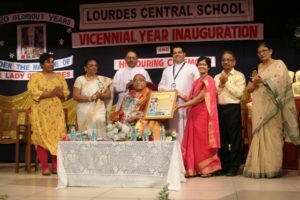 Fr Wilson Vitus D’Souza, Principal Rev Fr Robert D’Souza, Vice Principal Mrs Belita Mascarenhas, PTEC Vice President Mrs Veena Amrith, Vice President and Secretary of the Bejai Parish Pastoral Parishad Mr Stany Vas and Mrs Cony Saldanha were welcomed to the dais. 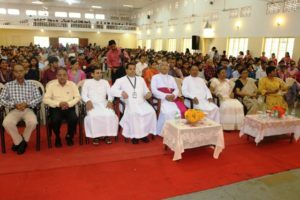 Assistant Parish Priest of Bejai Church Rev Fr Rohan Lobo and member of the School Management Committee Mr Roman D’Souza were also present on the occasion. 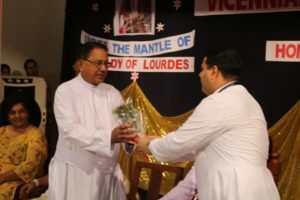 The School Manager Rev. 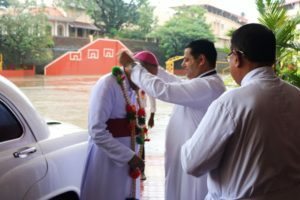 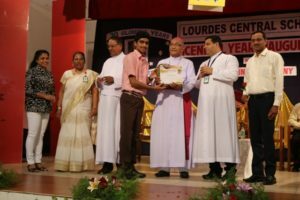 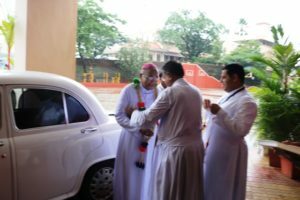 Fr Wilson Vitus D’Souza welcomed the dignitaries and the gathering, and the Principal Rev. 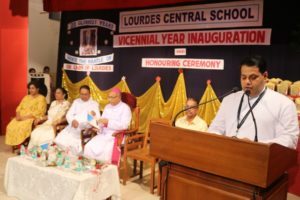 Fr Robert D’Souza gave the introductory address. 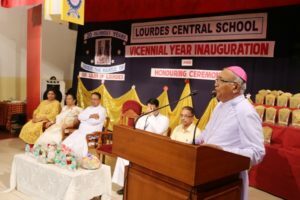 He spoke about the history, development, and achievements of the school. 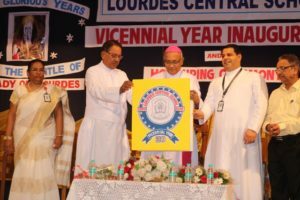 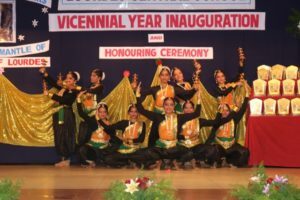 The significance of the commencement of the Vicennial year was brought out through an inauguration which consisted of unveiling the Vicennial school logo which had 20 stars on it, representing the 20 events to be conducted by the school. 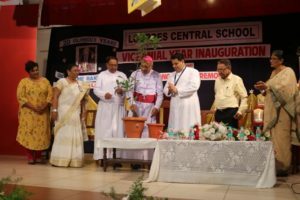 This was followed by planting a sapling to represent the growth of the school and to signify the nurturing of its students. 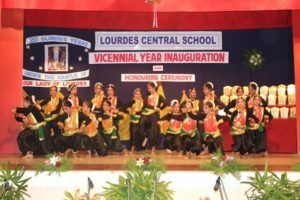 The honouring ceremony commenced with the felicitation of the district toppers of classes X and XII. 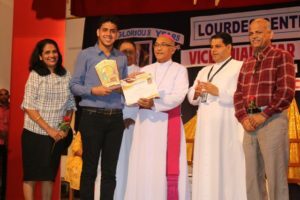 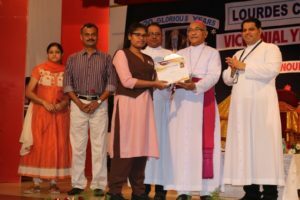 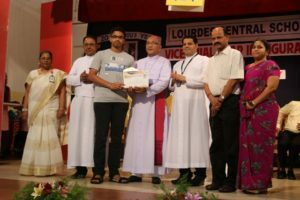 Reena Kishore (PCMB), Abel Shibu (PCMC), Gavin Abner Pinto (Commerce), and S. Nirupama (Class X), were felicitated by the Bishop. 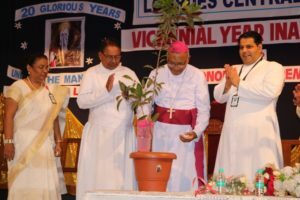 The Bishop was then felicitated with a plaque for being part of the establishment of the school 20 years ago and for being a support system throughout. 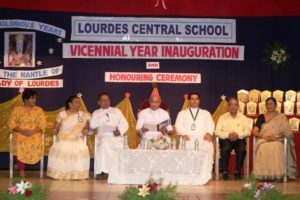 He gave the presidential address and congratulated the students and wished them to achieve greatness, after which the other school toppers were felicitated. 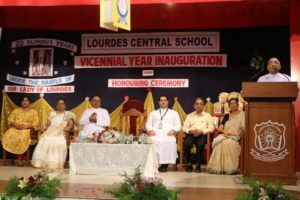 To conclude the event, the LCS Vicennial Year Documentary made by a team of students and staff members was screened which showcased the 20 year journey of the school. 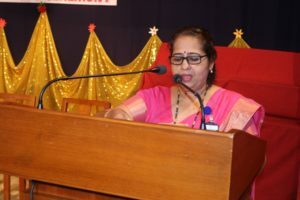 The program concluded with a Vote of Thanks by KG coordinator Mrs Lydia D’Souza. 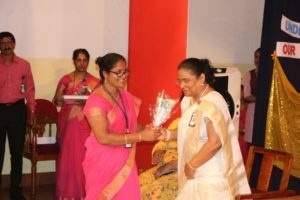 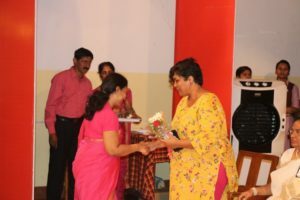 The program was organised by Mrs Deepa D’Souza, Mrs Sreelatha, Mrs Gretta Menezes, Mrs Chandini Chithraveer, and Ms Meghana Saldanha, and was compeered by Mrs Dilla Colaco and Mrs Vidhya Joseph.